The 14th Dalai Lama, Tenzin Gyatso, is the spiritual and political leader of the Tibetan people. He was awarded the Nobel Peace Prize in 1989 and has travelled extensively around the world offering the message of Tibetan Buddhism. The Dalai Lama was born in the small Tibetan village of Takster in Northern Tibet. His original name being Tenzin Gyatso. At the age of 2 Tenzin was recognized as the reincarnation of his predecessor, the 13th Dalai Lama. 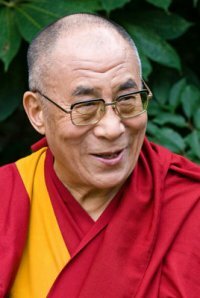 Thus from an early age the Dalai Lama spent many years studying Tibetan scriptures and he completed a doctorate in Tibetan Buddhist philosophy by the age of 25. The Dalai Lama means Ocean of Wisdom. Lama also means ‘Guru’ or teacher. The Dalai Lama’s are believed to be reincarnations of the Bodhisattva of compassion. These are beings who choose to reincarnate to serve humanity. As the Dalai Lama says himself. The Dalai Lama has sought to preserve parts of the Tibetan culture through educational and cultural institutions. He has also sought to raise awareness of the plight of Tibet to the wider world. The Dalai Lama has travelled extensively in the West meeting with many religious and political leaders. The Dalai Lama has said that there is a need for a variety of faiths and religions so that it can suit the different temperaments of people. He advises people to think very carefully before changing their religion. He has often said there is an underlying unity between the different world religions. The Dalai Lama himself has often described himself as being a simple Tibetan Monk. He rises at 4am to meditate and prayer. The Dalai Lama has also written many books on Buddhism and ways to inner peace.